This program introduces students to basic knowledge of Hematology/Circulatory system, Medical Terminology, Anatomy related to Phlebotomy, Infection Control. Students will effectively demonstrate the required skills to draw blood specimens by both venipuncture and capillary puncture to adult, pediatric and other non-blood specimens’ collection such as throat, and urine cultures for analysis from patients in Hospitals, Blood Donor Centers, Physician offices and similar facilities. 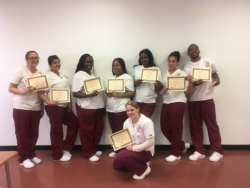 Upon successful completion of the program, students will receive a completion certificate by the school and will be able to take the National Certification exam through the National Health Career Association.